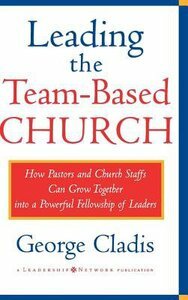 In Leading the Team-Based Church, George Cladis issues a clarion call for ministry teams to embrace a fresh leadership model that is not based on hierarchy, but on a process of collaboration that mirrors the relationship of Father, Son, and Holy Spirit. He reminds us that today's cultural environment--where authority has basis in trust, innovation reaps rewards, and spirituality takes root in life and work--has matured past the need for the hierarchy of traditional church leadership where the pastor had the final say. Through down-to-earth stories from his own experience and those of clergy in both mainline and evangelical churches, Cladis offers an exciting alternative to the traditional forms of church leadership, enabling pastors, congregational leaders, and staff to breathe new life into their ministries and unleash the full potential of the entire ministry team. Cladis, pastor of a fast-growing mainline congregation, demonstrates how cultural changes affecting all our institutions--not just the church--are making it easier to adopt this new model of leadership. Cladis's practical advice will enable ministry teams to work together in ways that both embody the Christian message and call forth the full creativity and love of the entire team. About "Leading the Team-Based Church"
Cladis was the pastor of Covenant Presbyterian Church in Austin, Texas during ten years of dramatic growth. He is now the pastor of Noroton Presbyterian Church in Darien, Connecticut. The Biblical Case For Team-based Ministry: Reflecting The God We Serve; Learning The Circle Dance Of God; Building On A Receptive Cultural Environment; The Dance Of Leadership: Building Graceful Ministry Teams; The Covenanting Team; The Visionary Team; The Culture-creating Team; The Collaborative Team; The Trusting Team; The Empowering Team; The Learning Team; Epilogue: A Word Of Encouragement; Resource: Two Examples Of Staff Covenants; References; Index.